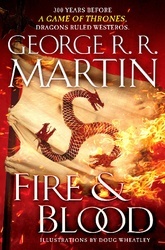 With all the fire and fury fans have come to expect from bestselling author George R. R. Martin, this is the first volume of the definitive two-part history of the Targaryens in Westeros. Centuries before the events of A Game of Thrones, House Targaryen—the only family of dragonlords to survive the Doom of Valyria—took up residence on Dragonstone. Fire & Blood begins their tale with the legendary Aegon the Conqueror, creator of the Iron Throne, and goes on to recount the generations of Targaryens who fought to hold that iconic seat. Plus, this essential chronicle, as related by a learned maester of the Citadel, features more than eighty all-new black-and-white illustrations by artist Doug Wheatley.